Pat and Gage, born in 1971 and 1995, respectively, are members of the Red Cliff Band of Anishinabe whose reservation is located at the northern most tip of Wisconsin, near the City of Bayport and the Apostle Islands. However, Pat was raised in Minnesota and lived near or on the Leech Lake, and Mille Lacs Reservations growing up and his elders were skilled in traditional crafts and Native ways. Aunts and uncles made blankets; others worked with beads, birch bark and sweet grass. In addition to harvesting wild rice, he and his siblings made Christmas ornaments and wreaths from balsam and birch bark and they collected wintergreen, seeds and nuts to both use and sell. Pat, who has lived on the Mille Lacs Reservation since 1989, after a stint in Bermerton, Washington where he worked for the Navy on WWII boats and submarines, now shares a home with Gage and his mother. 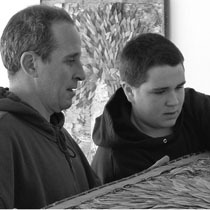 Pat took his first birch bark class at age eight. But it was the highly regarded Bug-O-Nay-Ge-Shig School, or Bug School, in Bena, Minnesota, that deepened his interests in Native traditions. Here he learned to work with beads, birch bark and sweet grass among other materials. His mother, who was trained in “all of the traditional ways,” also passed her knowledge on to her son. Gage now learns from them both. Mason Riddle is a Saint Paul-based critic who writes on the visual arts, architecture and design.